Managing visitors in your school can now be a seamless and speedy process, with our market leading visitor management system. Visitors are presented with an easy to use state-of-the art touch screen that significantly speeds up the signing in process. It means you can track the whereabouts of visitors in your school and accurately record visitors entering or leaving your site. It provides site access in a way that safeguards those who are in your school and completely removes the need for paper-based visitor books. The 19 inch InVentry touchscreen is clear and intuitive and has been specifically designed for usage in high volume areas, making it simple to welcome and sign in visitors. 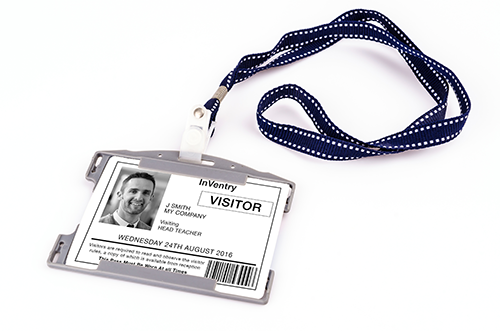 Instant badge printing means visitors are always clearly identifiable and with the built-in badge designer you can easily customise the look and feel of your badges. Ensure visitors provide their DBS information when signing in which is recorded back to your central record for future visits and is included on their visitor badges. Ensure that visitors agree to any terms and conditions including health and safety and evacuation procedures as part of the signing in process. The integrated webcam allows visitors to take their photo for ID badges and can be used for facial recognition for up to 60 days for more frequent visitors. The clever InVentry visitor management database remembers all your previous visitors to give returning visitors a swift and seamless experience. When a visitor arrives onsite an instant notification is sent via SMS or email to the person they are visiting. Create events that allow you to pre-book visitors into school events such as parents evenings or governor meetings.